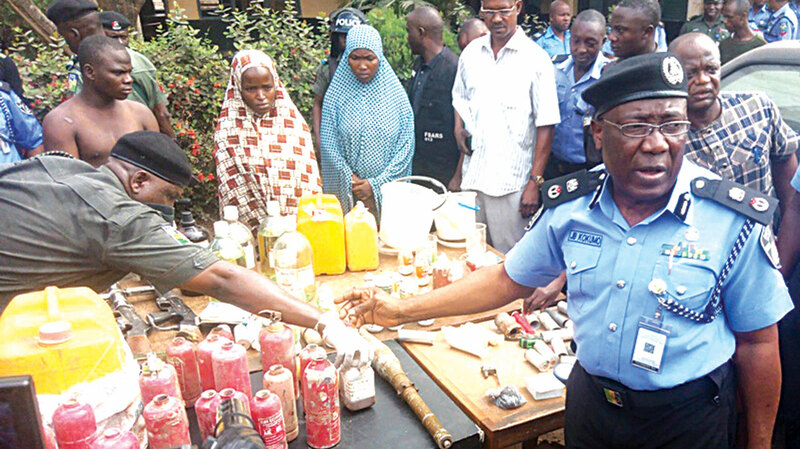 Commissioner of Police, Johnson Kokumo (right), parading the suspects and items recovered yesterday. The police in Edo State yesterday paraded a suspect identified as Ibrahim Idris, wife of the main suspect, identified as Oyiza Abdul, and her sister, Zainab Ibrahim for engaging in the fabrication of Improvised Explosive Device (IED) at Okugbe area near Iddo village, Okpella in Estako East local government area of the state. The suspects are indigenes of Okenne in Kogi State and Ibrahim is the younger brother to the main suspect on the run identified as Abdulamalik Idris Hassa Abdulmalik.The Commissioner of Police, Johnson Kokumo, said Abdulmalik escaped through a bush path after vigilant youths blocked him from escaping with his car, a Toyota Corola marked ABC 371 HK. Their activities in the community were exposed when one of the already manufactured bombs on Monday exploded and killed one Sanusi instantly. Kokumo said the police anti-bomb squad was called in to destroy some of the explosives and professionally took others away. The police boss said some of the arms recovered from the premises, which belonged to security agencies, had formation tags, an indication that they may have been stolen to be used for robbery operations. He listed the items recovered from the suspects to include one rocket propelled grenade (RPG), one Beretta pistol marked 53101466 with seven rounds of 9mm live ammunition, two riot gunners, four smoke pistols, 23 empty fire extinguisher cylinders, 18 plastic bottles of prepared borne IEDs,21 expended smoke cartridges, 17 pieces of pipes-part, two timer clocks, four remote control panel and four remote control switches, eight nine-volts batteries, eight live teargas cartridges and two smoke grenades. Others are two fire extinguisher borne IEDs, two electric junction boxes, two gallons of gun powder, one roll of cotton wool, five empty cans of insecticide, one pair of scissors, 20 small cans of assorted chemicals, three hydrometres used in measuring potency of the IEDs, eight pipettes tubes, two 50ml bottles of highly inflammable chemicals, three small bottles of highly inflammable chemicals, half bag of potassium nitrate, 65 litres of potassium nitrate, 200 grams of carbide and 30 pieces of syringes and needles. Ibrahim, brother to the main suspect, denied being a member of the gang and that he just relocated from Lagos few weeks ago where he learnt welding as a trade. He said he wanted to run away when he discovered his brother was making explosives and that he saw his brother take away some explosives to a place he didn’t know.